KERONE is having expertise in manufacturing of various types and capacity of heating and cooling systems. KERONE manufactures and exports superior quality Industrial Heating cooling Systems in the market. We are engaged in proffering Heating & Cooling Solution Service that is widely demanded in industries for heating, cooling, drying and curing applications. KERONE quality service is supported by the quality products we use. From Furnaces, Air Conditioners, and Heat Pumps. It uses heating and cooling elements that reach a low-high temperature. The element emits infrared radiation that travels through air or space until it hits an absorbing surface, where it is partially converted to heat and partially reflected. you can call us for all of your Heating and Cooling needs. We are committed to meeting your comfort needs and have a wide array of Heating and Cooling Products and Services that make our mission possible. Active Pharmaceutical Ingredient (API) manufacturing involves batch reaction, work-up, distillation, crystallization, hydrogenation, layer separation, filtration and drying as unit processes. Again, batch reaction involves heating and cooling stages ranging from -50oC to +250oC. Traditionally, this was being done with multiple utilities such as chilled brine, chilled water, cooling water, hot water, low pressure steam, high pressure steam, thermic fluid etc. Different heat transfer fluids (HTFs) may require separate coils, heating and cooling jacket zones or external heat exchangers. Time consuming changeover of HTFs and associated risks of human error. Multiple utilities can corrode the reactor jacket. Condensate recovery is not feasible. Inefficient management of HTFs leading to inaccurate temperature control. Process parameter deviations adversely affect product quality. Complicated mechanical design, and Increases capital/maintenance costs. Single fluid heating cooling systems (SFHC) / Temperature Control Unit (TCU) are coming-up as an ideal solution to overcome most of the limitations with traditional multiutility based heat transfer and control system. where high accuracy and wide temperature ranges are critical for the development of new compounds and API's. Temperature range - 35°c to 250°c with precise temperature control, +/-1°c. Rapid heating or cooling, reducing batch time. All wetted parts are in stainless steel. Totally enclosed skid & mounted on wheels for easy mobility. No switching between jacket service fluids, preventing cross- contamination, corrosion or thermal shocks to the vessel. Accurate temperature control to +/-1oC without risk to your reactor. Rapid heating and chilling profiles can be designed, reducing batch times. Measurement for meeting FDA requirements. Programmable heating and cooling ramps for accurate unsupervised operations. No switching between jacket service fluids, preventing cross contamination, corrosion or thermal shocks to the vessel. Smooth, continuous temperature control, with no gaps because there is no fluid changeovers. 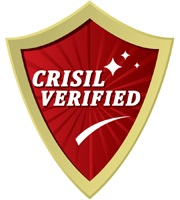 No interruption of process and no hot spots, resulting in higher product yields and quality. Off batches are minimized, if not eliminated. Savings on expensive raw materials can be made because the yield is maximized without adding excess reactions. Suitable for the very cold operating temperatures required by today’s new chemical formulae and reactions. Fully automatic capability, hence less manpower required. Applications where sudden temperature rise, causing thermal shocks. Pioneers in SFHC / TCU for the last 10 years. Prompt service support with dedicated servicing team. Swift response for the customer queries through dedicated technical team. 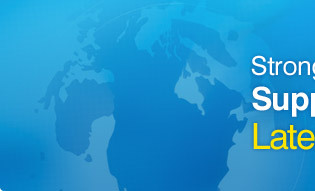 Right & Reputed international component selection. Hot Water Systems are engineered to provide accurate, reliable and cost effective temperature control for process load. single and dual zone configurations. Flowtech also designs and manufactures specialized equipment for non-standard applications. 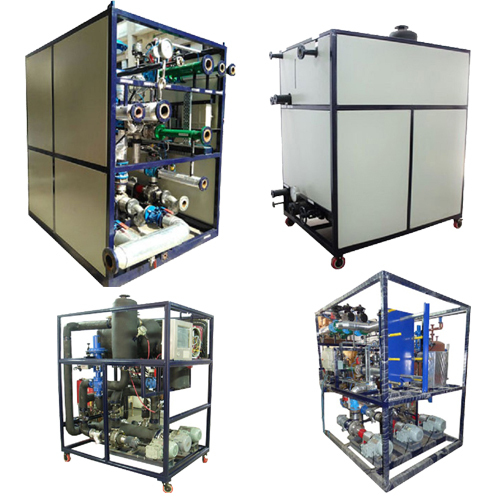 Our engineers have extensive experience in process chilling and heating applications for such industries as Chemicals, Petroleum, Plastics, Rubber, Paper, Power, Steel, Food And Pharmaceuticals. Why Hot Water System needed ? The temperature in the jacket can be controlled much more accurately with hot water than with steam. This higher degree of control protects against damage to or loss of product through overheating. Hot water distributes heat more evenly than steam. This eliminates hot spots which often cause product to bake onto the walls of the vessel, and at worst, ruin the entire batch. Hot water ensures a better quality end product. This is particularly important in processes requiring very precise product temperature control. In critical processes utilizing glass-lined reactors, steam shocks can damage the glass lining. Hot water allows smooth transitions from heating to cooling with no thermal shock. Standard units supplied with PID controllers. Special control packages available with PLC systems. Each Hot Water System is designed to maximize the productivity of the process. Kerone quality and reliability provide excellent value for investment. Reliable temperature control improves process consistency, reduces scrap, speeds start-up and increases production rates. 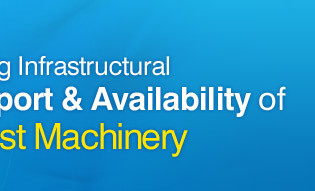 Instantaneously available when you need for fluctuating process loads and urgent demands. Ensures accurate temperatures for hot water required for the most heat sensitive processes. System designed with heat exchangers with very high heat transfer rates and efficiency. System Design Pressure - 4 to 5 Kg/cm². Max. Steam Pressure - 2 to 3 Kg/cm². Max. Cooling Water pressure-2 to 3 Kg/cm². Expensive and high-grade products are not produced in large quantities, as they are typical for pharmaceutical industry, & also forfine/special chemical areas. Small, flexible facilities are necessary for these applications, which can be easily cleaned quickly be adjusted for the next product. They need corrosion resistant materials that do not interact with the product and do not contaminate it. In addition, it is frequent that only limited space is available for the assembly of the facility, and therefore compact design is preferred. Traditionally, the fine chemical and pharmaceutical industries have favoured batch reaction, so we have provided multipurpose reactors which can perform various chemical reactions. 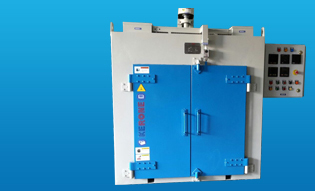 KERONE has developed a systems perspective to reaction technology, whereby a fully functional reaction unit, including peripheral equipment, is built and assembled in our workshop as a skid, then delivered to the customer as a complete operational system. Reactor of respective size with Mechanical seal, suitable agitator. Motor, Gear Box, Bottom valve & Cladded insulation. Skid of suitable size to mount all above equipment together to form "Kilo lab reaction unit". Following reactions / Operations could be carried out in the system. Any type of reactions involving Liquid – Liquid, Liquid-Solid, Liquid–Gas reactions. Any operation like continuous addition of liquid reactant, mixing of the two phase liquids, layer separation etc. Any distillation operation involving reflux, moisture separation (Dean Stark), high vacuum distillation etc. Any reaction involving highly viscous material, OR crystallization operation. Any customer specific requirement could be discussed at the design stage. All the process piping is complete within the skid & requires external connections only. Vacuum pump connection to the reactor system needs to be connected at one place only. Distribution of the vacuum within skid is already provided. All the cabling within the skid is provided. The customer needs to connect only power connection to the system. 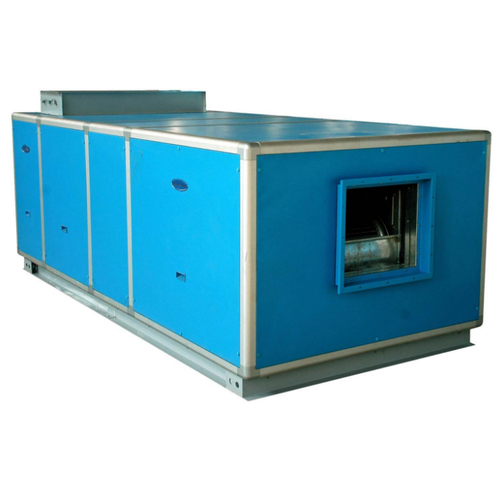 Condenser utility supply manifold is provided within the skid. All the basic requirements of measurement & safety like vent valves. Pressure gauges, drain valves & static jumpers are provided with the system. Reactor vessel support & platform is provided within the system. All the wetted & non wetted parts are of Suitable grade stainless steel. All the surfaces are polished to avoid any deposition of the reaction mass on the surface & improve the cleanability of the same. temperature & pressure in almost every solvent. All the piping & condensers are designed in such a way that there is no any liquid hold up in the system at the end of the batch. After every batch the reactor base could be removed very easily & can be cleaned so as to ensure no contamination from previous batch. Mechanical seal area of the top dish could be flushed thoroughly from the bottom side. Lantern stool of the agitator could be lifted easily without dismantling any nozzle of the reactor for cleaning purpose. 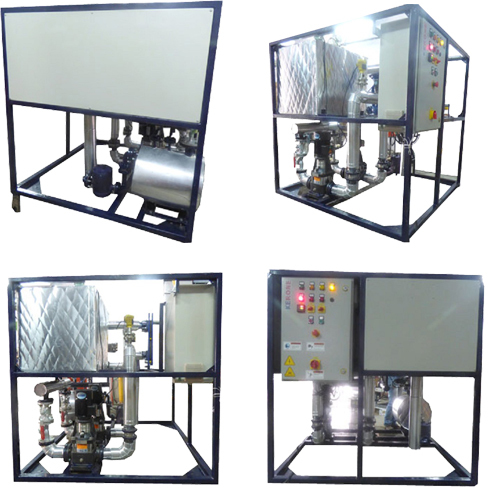 We can provide CIP system to flush all nozzles of the reactor using suitable solvents. We carry out validation of the system in cGMP point of view & submit all the relevant documents along with the system. Temperature - 90 to + 300 Deg. C.
MOC - SS-304, SS-316, Or any other user specific requirement. Operating RPM of Agitator 0 - 300 RPM. Expensive and high-grade products / solvents are not produced in large quantities, as they are typical for pharmaceutical industry & also for fine/special chemical areas. Small, flexible facilities are necessary for these applications, which can be easily cleaned and quickly adjusted for the next product. They need corrosion resistant materials that do not interact with the product and do not contaminate it. In addition, it is frequent that only limited space is available for the assembly of the facility, and therefore compact design is preferred. Traditionally, the fine chemical and pharmaceutical industries have favoured batch distillation. 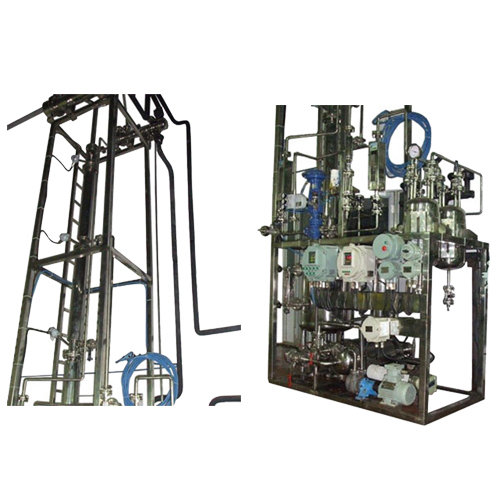 Hence we have provided multipurpose distillation unit which can perform various types of distillations. 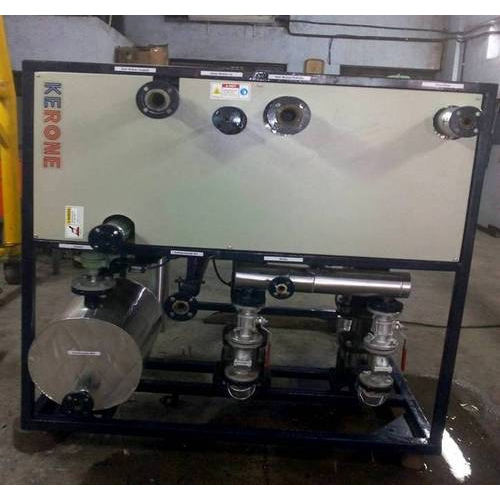 KERONE has developed a systems perspective to distillation technology, whereby a fully functional distillation unit, including peripheral equipment, is built and assembled in our workshop as a skid, then delivered to the customer as a complete operational system. Column Packings – Pall Rings, Raschig Rings, Saddles, Structured Packings, etc. with any suitable MOC. Skid of suitable size to mount all above equipment together to form "Kilo lab distillation unit". Vacuum pump connection to the distillation system needs to be connected at one place only. Distribution of the vacuum within skid is already provided. All the basic requirements of measurement & safety like vent valves, Pressure gauges, drain valves & static jumpers are provided with the system. All the gaskets used in the system are of PTFE which are very easy to clean. These gaskets are also compatible over wide range of temperature & pressure in almost every solvent. Mechanical seal area of the top dish could be flushed thoroughly from the bottom side. Lantern stool of the agitator could be lifted easily. without dismantling any nozzle of the reactor for cleaning purpose. Vacuum gauges on reactor, receivers, vacuum manifold.